Today, he is considered one of the most renowned painters of the Victorian era, as well as one of the best and most accomplished nightscape, and townscape, artists of all time. Grimshaw's accuracy and drive for realism was criticised by some contemporaries, with one critic claiming that his paintings appeared to ‘showed no marks of handling or brushwork’, adding that ‘not a few artists were doubtful whether they could be accepted as paintings at all’. 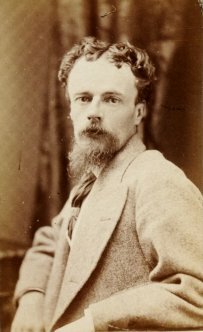 However, other contemporaries recognised his mastery of lighting and technique, and James McNeill Whistler, whom Grimshaw would go on to work with in his Chelsea studios, stated, “I considered myself the inventor of nocturnes until I saw Grimmy’s moonlit pictures”. His early paintings were signed "JAG", "J. A. Grimshaw", or "John Atkinson Grimshaw", though he finally settled on "Atkinson Grimshaw". He was born 6 September 1836 in a back-to-back tenement in Park Street, Leeds to Mary and David Grimshaw. In 1856 he married his cousin Frances Hubbard (1835–1917). In 1861, at the age of 24, to the dismay of his parents, he left his job as a clerk for the Great Northern Railway to become a painter. He first exhibited in 1862, mostly paintings of birds, fruit and blossom, under the patronage of the Leeds Philosophical and Literary Society. 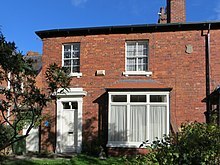 He and his wife moved in 1866 to a semi-detached villa which is now numbered 56 Cliff Road in Headingley and has a Leeds Civic Trust blue plaque, and in 1870 to Knostrop Hall. He became successful in the 1870s and rented a second home in Scarborough, which became a favourite subject. He died on 13 October 1893 of tuberculosis and is buried in Woodhouse Cemetery, (now called St George's Fields), Leeds. Several of his children, Arthur E. Grimshaw (1864–1913), Louis H. Grimshaw (1870–1944), Wilfred Grimshaw (1871–1937) and Elaine Grimshaw (1877–1970) became painters. Grimshaw's primary influence was the Pre-Raphaelites. True to the Pre-Raphaelite style, he created landscapes of accurate colour and lighting, vivid detail and realism, often typifying seasons or a type of weather. Moonlit views of city and suburban streets and of the docks in London, Hull, Liverpool and Glasgow also figured largely in his art. His careful painting and his skill in lighting effects meant that he captured both the appearance and the mood of a scene in minute detail. His "paintings of dampened gas-lit streets and misty waterfronts conveyed an eerie warmth as well as alienation in the urban scene." Dulce Domum (1855), on whose reverse Grimshaw wrote, "mostly painted under great difficulties", captures the music portrayed in the piano-player, entices the eye to meander through the richly decorated room, and to consider the still and silent young lady who is listening. Grimshaw painted more interior scenes, especially in the 1870s, when he worked under the influence of James Tissot and the Aesthetic Movement. On Hampstead Hill is considered one of Grimshaw's finest works, exemplifying his skill with a variety of light sources, in capturing the mood of the passing of twilight into night. In his later career his urban scenes under twilight or yellow streetlighting were popular with his middle-class patrons. In the 1880s, Grimshaw maintained a London studio in Chelsea, not far from the studio of James Abbott McNeill Whistler. After visiting Grimshaw, Whistler remarked that "I considered myself the inventor of Nocturnes until I saw Grimmy's moonlit pictures." Unlike Whistler's Impressionistic night scenes Grimshaw worked in a realistic vein: "sharply focused, almost photographic", his pictures innovated in applying the tradition of rural moonlight images to the Victorian city, recording "the rain and mist, the puddles and smoky fog of late Victorian industrial England with great poetry." Grimshaw's paintings depicted the contemporary world but eschewed the dirty and depressing aspects of industrial towns. Shipping on the Clyde, a depiction of Glasgow's Victorian docks, is a lyrically beautiful evocation of the industrial era. Grimshaw transcribed the fog and mist so accurately as to capture the chill in the damp air, and the moisture penetrating the heavy clothes of the few figures awake in the misty early morning. Grimshaw left behind no letters, journals, or papers. His reputation rested on, and his legacy is based on, his townscapes. There was a revival of interest in Grimshaw's work in the second half of the 20th century, with several important exhibitions devoted to it. A retrospective exhibition "Atkinson Grimshaw – Painter of Moonlight" ran from 16 April 2011 to 4 September 2011 at Mercer Art Gallery in Harrogate and subsequently in the Guildhall Art Gallery, London. Spirit of the Night, 1879. Reflections on the Thames, 1880. Nightfall on the Thames, 1880. Shipping on the Clyde, 1881. ^ Christopher Wood, Victorian Painting, Boston, Little, Brown & Co., 1999; p. 173. ^ H. J. Dyos and Michael Wolff, eds., The Victorian City: Images and Realities, 2 Volumes, London, Routledge, 1973. ^ a b Dyson, Peter; Grady, Kevin (2001). Blue Plaques of Leeds. Leeds Civic Society. p. 78. ISBN 0905671228. ^ Philip J. Waller, Town, City, and Nation, Oxford, Oxford University Press, 1983; p. 99. ^ Lionel Lambourne, Victorian Painting, London, Phaidon Press, 1999; p. 112. Wikimedia Commons has media related to John Atkinson Grimshaw.